At City Hardware we care about the environment, and are committed to providing safer, environmentally friendly alternatives to traditional products. We currently offer more than 100 different environmentally safer or better products throughout the store - from cleaning supplies to gardening products to paints and adhesives to plumbing and electrical parts - and are always looking for more! Look for the Green Zone sign and the City Hardware green leaf throughout the store to quickly locate these products! 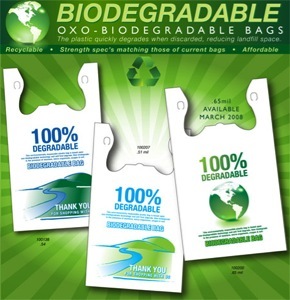 Did you know City Hardware has been using only 100% biodegradable, or recycled/recyclable plastic bags since Feb 2008? Yep, it’s a fact. So although we’d love for you to bring your own reusable totes to pack your stuff in, you don’t have to feel bad about taking one of our bags if you need to! Need to replace fluorescent bulbs or tubes and don’t know what to do with the old ones? While it is not yet free to recycle used fluorescent bulbs in Seattle, we’ll take those nasty old bulbs down to EcoLights recycling in Georgetown - and pick up the tab - for you! Just bring your old bulbs in and exchange them by purchasing new ones from us. For every bulb purchased, we will take one bulb off your hands, and do the rest. Simple! If you need to do more than a one-to-one bulb exchange, and have many bulbs to discard without equal purchase, our friends at Goods for the Planet, around the corner from us on Dexter Avenue N., will be happy to take your bulbs for a fee. As you can imagine, we use a lot of rags around the store - for everything from paint mixing to general clean up. Recently, star staff member WIlly suggested we might conserve resources a bit if we collected old clothes from customers and recycled them as rags instead of continually purchasing from our own stock! A great idea, if we do say so ourselves! So if you have old clothes you just don’t want to throw away, but are really not suitable for donation elsewhere, donate them to us and we’ll put them to good use! Have old rechargeable batteries and cell phones you don’t know what to do with? * rechargeable batteries only, please. Standard Ni-Cad batteries (AA, AAA, C, D, etc.) are not recyclable through call2recycle. At City Hardware, we’re concerned about the environment, and global warming in particular. We’re living in a time that may be a historical tipping point in the ecological balance of our planet, and we - all of us who inhabit the planet together - are playing a primary role in that change. The CO2 emissions we pump in to the atmosphere through the course of our daily lives is warming the planet (no, it’s not a myth) at unprecedented rates, and the ultimate impact of this warming will likely profoundly change our lives - and our planet - forever. We’re playing a small part in contributing to efforts to reduce CO2 emissions through the use of alternative, cleaner energy like wind, solar, water and natural gas. We’re doing this in partnership with terrapass, a company founded to reduce the “carbon footprint” we leave on our planet through investment in alternative energy projects. Pretty exciting stuff! So look for our totes the next time you’re visiting us and get yours - to own or loan! •If you decide not to return your tote that’s OK too! It’s yours to keep and reuse over and over again. 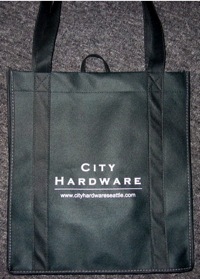 •We re-ordered 1,500 our very popular City Hardware reusable totes, which arrived mid-Sep, 2011. •We sell these totes every day for just $1.49, and donate 100% of the profits from these sales to terrapass. •If you forget to bring a reusable bag the next time you’re shopping with us, you’ll be able to purchase one of our totes...and return it for a refund of most of the $1.49 price! We’ll keep a small amount as a loaner fee and donate 100% of that fee to terrapass.